In a week-long poll of our readers, the OB Rag asked which of the five finalists did people like for the “new” OB Entryway Sign. Over half – 54% – said they wanted to keep the current design but renovate it. 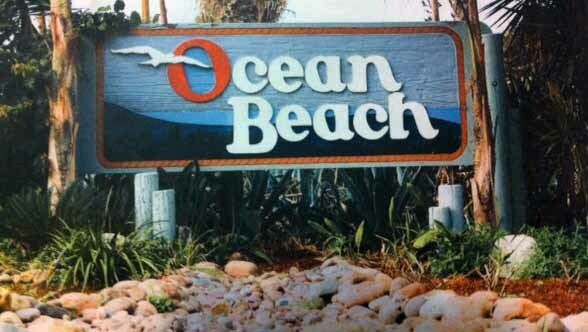 The OB Town Council has weeded down all the entries for the new sign to five finalists, and we posted the images here. Another 9% wanted the current design also, but to add parrots, as in Option 3. A total of 13% wanted parrots in the new design. Other options received only 1 to 4% of the vote. 17% of the respondents could not decide which they liked. That’s a relatively large proportion. 4% told us they didn’t like any of the designs. And 7% said they weren’t voting because they believed all residents ought to be able to decide the finalist, not just members of the OBTC. The poll was up on our site for a week, from Jan 24th through the 31st. 69 readers responded. As in all our polling, we cannot – at this point – determine whether respondents live in OB or the Peninsula. Just the same, many of our readers do or did live in OB and their opinions count for us. Clearly, most want the current OB Entry Way design, upgraded to get rid of the termites. Here is the entire poll and the responses. (The first number is the total number of votes for each option, followed by the percentage of the total vote. OB RAG POLL: Which of the 5 design finalists do you want to see as OB’s Entry Way Sign (including the current design)? Make your vote here as only members of the OBTC will decide the finalist. Option 1: Keep the same design, but renovate the sign. Choice 6: I’m not voting as I believe all residents should be able to vote on the design without having to join the Town Council. Choice 7: I don’t like any of the finalists’ designs. Choice 8: They all look good. Cannot decide. I would like to nominate (decidedly late) the “Green OB” from the origonal “OB Rag” Centerfold. I realize it is probably too late, but that’s my two cents. Whatever that is worth.